Does anyone have any good ideas for tourist and non tourist activities to do in Moscow in the winter? I am going there for a week for New Year. I have been once before in the summer so I have already done the obvious tourist stuff; Red Square, Kremlin, Tretyakov Gallery etc. I was hoping it would be really cold and 6ft of snow, but sadly it doesn't look as if I'm going to be in luck. Take the metro for 8 straight hours! Thanks, I'll bare that one in mind. Apparently it has been snowing in Moscow today, so it could well happen Any other brilliant ideas? Find a banya. Go ice skating. Jump in the Moscow river. Ride one of the free-range bears that wander the streets of Moscow. Banya and iceskating, that's more like it. Know any good ones? Also, do you know if things will be open on the 1st of January, restaurants etc? Our Moscow based Russians seem to be awfully quiet! Perhaps they are all building snowmen If one does happen to appear then I have another question. If it is snowing, where can I get a ride on a Troika? I just work in Moscow, I don't live there... Sorry, but I have no idea what to do at Moscow during the New Year holidays. Restaurants, night clubs, shows... may be, but it isn't my stuff, so I can't give you any advice. I, personally, if it will be snow, going to go to the countryside and have fun - hare(may be boar)-hunting, banya, cold river bathing and, of course, vodka. Btw, at this friday they promise +5C again. Hahaha. They are for children mostly (and may be tourists ). Sorry, but I simple don't know. May be someone else can help? There is nothing to do around New Year. Unless you know someone you can't go visiting and there's nothing else to do. All we do around New Year is visiting. There is nothing to do around New Year. Unless you know someone you can't go visiting and there's nothing else to do. All we do around New Year <strike> visiting </strike> drinking. The better way is spend your time in some hotel in the forest no far from Moscow (approx. 50-100 km). 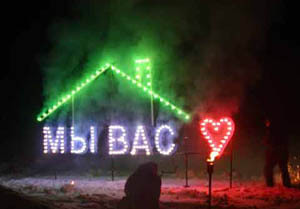 Skiing, horse riding, paintball, snowmobiles at afternoon and banya and drinking at night. But all hotels are reserved till 11 of January already in Autumn. I will be spending New Year with a Russian family, so I'm very excited about that Maybe another year I'll book a hotel further out of Moscow, it sounds like a lot of fun. Buy a lot of Chinese pyrotechnics and make a lot of noise and fire at New Year night. Not necessary Chinese. There are very good pyrotechnics produced at the factory not far from Moscow - at Sergiev Posad (former Zagorsk, there Trinity-St.Sergius Lavra located). I already went there and bought a load of pyrotechnics thrice cheaper than at an ordinary store. By Knave in forum Translate This!